As online video marketing becomes increasingly important for martial art schools, more and more school owners are seeking to leverage this advertising medium to get more students. However, marketing online with bad video can do your dojo more harm than good. And that’s why we have Christopher Perilli on the podcast this week. Chris is an experienced videographer who runs a video production company that specializes in creating ads and infoproducts for the fitness and martial arts industries. And with his latest venture, he says his goal is to revolutionize the way martial art schools use video to market online. 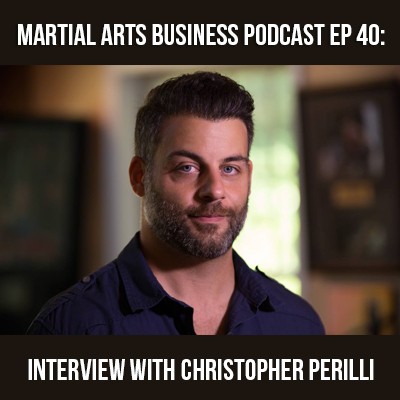 In this interview, Chris shares a great deal of insight about online marketing for martial art schools, how to use video the right way to market your school, and he also shares the top strategies that his clients are using right now to get new students. And, in The Tip of the Week, I share some of what I’m doing to market my classes using videos that were shot and produced by Chris and his production team. DojoVideos.com – This is where you’ll want to go to get your own customized video from Chris. Dojo Muscle on Facebook – The Facebook page for Chris’ company. MA Biz U – The online martial arts business coaching program that Bill credits with much of his school’s growth. 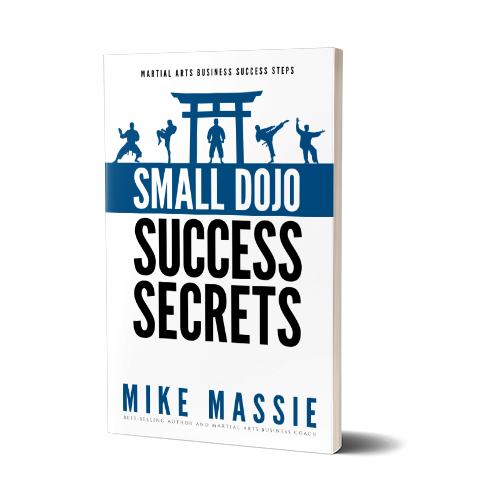 The Martial Arts Marketing Success System – This Mike’s newly revised and updated Martial Arts Marketing Success System, with 45 new pages added to the manual, two hours of new audio and video, and completely updated strategy and marketing plans for marketing your dojo both online and offline. Hello to everyone out there in the Martial Arts Business Nation and the Small Dojo Big Profits Tribe. This is Mike Massie coming back at you once again with another edition of the Martial Arts Business Podcast. Now, today’s interview on the podcast is a very long interview, so I don’t want to take too much time in introducing my guest. His name is Christopher Perilli. Christopher is the founder and owner of a couple of different companies that cater to the martial arts industries specifically in delivering marketing resources and marketing services. Chris is a very talented individual. He is not a martial art school owner, but he is a martial artist. His main area of expertise is actually in video production and video marketing. He shoots videos all over the nation and all over the world for some very prominent business owners and entrepreneurs. What he’s done is he has taken his expertise in the video marketing arena and brought it to the martial arts industry with very, very nice highly professional marketing videos for martial arts schools. We’re going to talk about that. It comes up later on in the interview because we wanted to talk about some other things first. Chris also is a very knowledgeable marketer. He shares a lot of information and insight from his perspective in working in internet marketing, online marketing, working in the direct response marketing world as a videographer for years and years and also doing marketing himself as an entrepreneur. He brings quite an interesting perspective to martial arts marketing and shares a lot of information in the interview. I was happy to have him on the show. I have known of Chris for several years. We were introduced many years ago and I was reintroduced to him recently through Facebook and have been following what he has been doing with his business. My personal opinion as far as Chris or anybody else goes, anybody who comes to the martial arts industry who brings a fresh perspective and who helps elevate the level of professionalism in the martial arts industry, I want that person to succeed. That’s one of the reasons why I’m having Chris on the show today. I think he has a lot of interesting information to share with you guys, so I hope you enjoy it. Then, of course, later on in the show after the interview, we will have the Tip of the Week. I’m going to talk to you a little bit about video marketing and just tell you about some things that I’m doing to market my classes using some videos that I got from Chris and using those videos to market on YouTube, Facebook, et cetera, et cetera and kind of share that information with you. Hopefully, that’ll help you in case you do decide to order from Chris or use your own videos to market to use video more effectively marketing your school. Without further ado, we’re going to get straight into the interview with Chris Perilli, and I hope you enjoy it.